By request, we're reprinting our roundup of nearby castles: old-school McMansions where you can storm the gates. Oheka Castle Located in Huntington, New York, Oheka is the second-largest private residence ever built in this country. It was the summer home of financier Otto Kahn, set on 443 acres. Now it's shrunk to 23 acres — still plenty of room to enjoy as a guest of the hotel or during one of the many weddings or corporate events held there. Castle on the Hudson New Yorkers used to a tight-squeeze, domestically speaking, will revel in this hotel, 30 miles north of the city, overlooking the Hudson River in Tarrytown. It's a member of Small Luxury Hotels of the World, 'small', of course, being a matter of what you're used to. 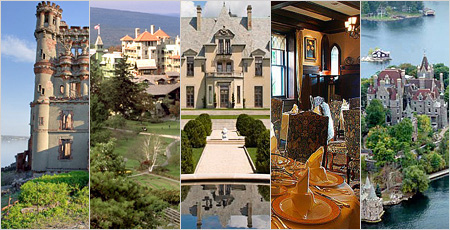 The hotel's restaurant, Equus, is country castle ultra-luxe. Mohonk A Victorian castle built in 1869 over Lake Mohonk in the Hudson Valley. Tons of activities on site and nearby. Meals are included in rates. Castle Clinton Keeping out those pesky Brits was the first order of business for Castle Clinton, later an opera house, immigration station, and aquarium. Boldt Castle Way up in Alexandria Bay, NY, George Boldt, the original proprietor of the Waldorf=Astoria, started work on his castle in 1900—a token of love to his wife, Louise. Before the 120-room structure was completed, Louise died suddenly and the incomplete castle was left to molder, Miss Havisham-style. Since 1977, it's been returned to life and you can visit from May to October (events can be held here, too).